(mPOS) Mobile POS Terminals Market size is set to exceed USD 55 billion by 2024; according to a new research report by Global Market Insights, Inc. The global shipments are forecast to surpass 35 million units by 2024. The ubiquitous acceptance of EMV card standards across developed regions including UK and the U.S. are the major mPOS terminal market growth drivers. Initially viewed as a generic payment processing option, these are now devices that can offer sophisticated analytics with superior processing capability, wireless communication support, and store management functionalities such as inventory or customer behavior tracking. The proliferation of smartphones and tablets and the rising trend of mobile wallet technology have led to the conversion of consumer electronics into checkout terminals; this trend is expected to favorably drive mPOS terminals market growth. The growing sales transaction through the card-based mode of payment is expected to fuel the mPOS terminal market growth. Industry players are investing in the development of advanced software solutions for data analytics, multiple platform support, and tracking of customer data. In addition, companies have been focusing on creating revenue channels by providing accessories such as card readers and dongles for card swipe, mobile printers, and peripheral devices. 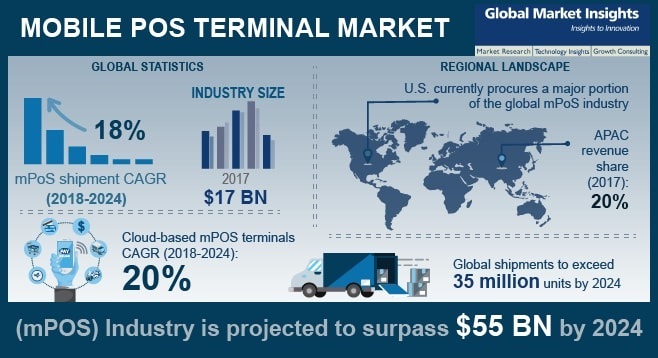 Ubiquitous internet connectivity and penetration of contactless NFC-based payment methods have further accelerated the upgrade of traditional registers resulting in the growth of the mPOS terminal market. Mobile apps offer additional revenue growth opportunities for market players targeting SMBs, micro-merchants, and small retailers. The benefits of mPOS terminals including reduced wait times for customers, enhanced security features, paper-free receipting services, and free floor space, which have enabled the adoption and growth of the market. Furthermore, the integration of new technology solutions, such as biometric identification, RFID (Radio Frequency Identification), and VoIP (Voice Internet Protocol), alleviates the security and performance of mPOS devices thereby stimulating the growth of the global mPOS terminal market. The surge in volume of card transactions is expected to favorably impact mPOS terminal market growth. The decline in the average selling price of tablet devices over the past few years has resulted in a sharp growth across regions including China, India, Brazil, and Mexico. Tablets/smartphones can also be converted into payment terminals through mobile apps and the use of sleeves or dongles for card swipe. The need for efficient line-busting schemes has escalated the demand for faster, more effective, and scalable checkout solutions leading to increased adoption of the devices across industry verticals. Government efforts to accelerate and promote cashless transactions through digital payments serve as a key driving factor for mPOS terminal market growth. For instance, in 2016, the demonetization in India resulted in the conversion of payment modes from cash-based payments into card transactions. In addition, the universal acceptance and transition toward EMV (MasterCard, Visa, EuroPay) chip card aids in improving the reliability and security of a cashless transaction. A Federal Reserve study across the U.S. estimated that over USD 178 trillion non-cash payments were made in the country in 2015. The rise in the number of cashless transactions is expected to serve as a key driving force for the global mPOS terminals market. The rising transition toward the use of tablets and other consumer-grade devices for managing payment processing needs will drive the mPOS software market. The increased penetration of Near-Field Communication (NFC) and contactless payment and the standardization of the EMV technology are expected to facilitate the mPOS terminal market growth. Various mobile wallet channels and online portals have created additional revenue growth opportunities for market players as they offer ease-of-use and convenience for customers. Data security concerns regarding wireless technology devices and a rise in cybercrimes are among a few growth restraints.